On December 4th, a case of hakmarrje ended up with the wounding of a person. The victim kidnapped the cousin of his assailant a month earlier. At the end of the month, a 17-year-old girl was killed and her boyfriend was seriously wounded in Tirana. It seems that the violence happened due to the jealousy of another suitor of the young girl, who had received a slap from her boyfriend, then severely injured. In addition, this month a 39-year-old man was killed in Topojan – Dibër region – by his ex-father-in-law, with whom he had been in conflict since he was left by his wife. After a fight, the victim wounded a friend of his ex-father-in-law with a knife and threatened to kill the latter and his family. The ex-father-in-law’s reaction (“for self-defense”, as he claimed) was to hit the ex-son-in-law on the head with a piece of wood, killing him. In order to avoid the victim’s family revenge the police is now patrolling the murder’s house. On December 6th, Albanians celebrate St. Nicholas day. It is deeply felt by the families we work with, which invited us to spend the previous evening with them for this occasion. 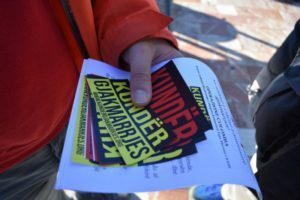 On December 10th – 70th Universal Declaration of Human Rights anniversary – we launched the national campaign “Kundër Gjakmarrjes” (“Against blood feuds”) in Shkodër, in order to raise awareness on the vendetta phenomenon among Albanian population and to invite each citizen to take a clear and active stand against the blood feuds. For the occasion more than 2.000 stickers with the campaign’s logo were distributed and 13 banners with messages of peace, forgiveness and reconciliation were put along the main streets of the city. Furthermore, during the evening we organized some performances at the Arka Youth Center as: a video showing about some previous campaigns of opposition to the blood feuds phenomenon implemented by Operazione Colomba; a theatrical reading about the people who decide to live self-isolated to their houses because of the fear of incurring in the revenge; a live music concert by the Albanian singer Jozefina Simoni. During the month of December, we have carried on regular visits to the families involved in a blood feud and we have escorted their women and children to the prison in order to allow them to meet their relatives. Moreover, an episode required us great attention. It regards to Alfred, who came back to Albania with his whole family at the beginning of December because Germany refused their applications for international protection. We fear that the return to their place of origin may provoke tensions among the rival family components who live in the same village. At the end of the month, we went to the region of Tropoja to wish a Merry Christmas and a Happy New Year to some families. There we also met a family who suffered a violent loss and now must decide whether to take revenge or not. We stood by its members with words of peace and solace hoping that our support is able to discourage them from resorting to a destructive management of their conflict situation. 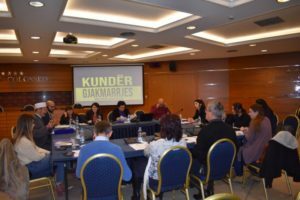 On December 12th, we organized a round table discussion in which representatives of some local administrative offices, religious institutions and Albanian associations took part. The aim of the meeting was to device a common strategy to overcome the phenomenon of blood feuds, and the debate among all the attendees was very fruitful. In this respect, we would like to thank the Italian Ambassador Alberto Cutillo for the supportive message to the initiative he sent us on this day. Lastly, this month we have also continued our collaboration with the Ngo Gruppo Umana Solidarietà (GUS) through attending, along with other associations and local institutions, its periodic meetings on the topic of opposition to violence and to its radicalization. 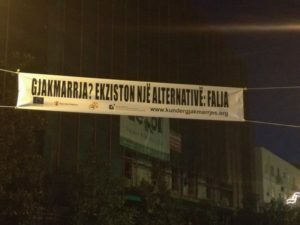 This blog is written in the framework of the project “Alternative dispute resolution and legal aid to solve blood feuds” as part of the subgranting scheme of the project The Civic Engagement for a Functional Judiciary System and Access to Justice in Albania, funded by the European Union and implemented by Save the Children and the Centre of Integrated Legal Services and Practices.